GEEE 2019: The GEEE is the abbreviated form of Galgotias Engineering Entrance Exam. As the name suggests, the test is for all the aspirants of engineering field looking for the best institute to pursue their technical graduation. The Galgotia Entrance Exam 2019 is the university level exam for the campus situated in Greater Noida. Aspirants of the engineering exam eyeing on the courses offered here in the university can read out complete information here. 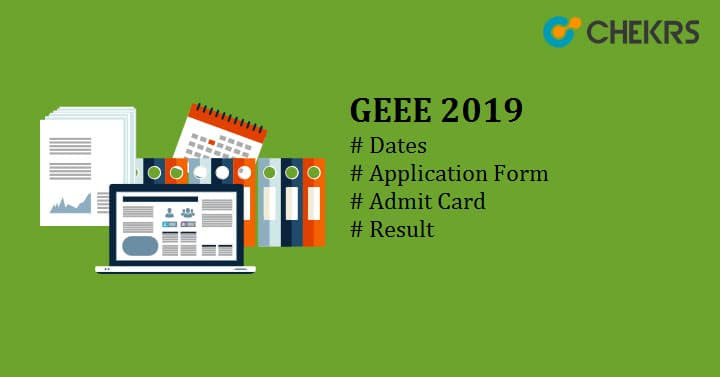 Here in the article, we are providing information on complete details such as GEEE 2019 Important Dates for notification, how to submit the application form, exam pattern, syllabus and results and all other post exams events required before submission of the exam. The Galgotia Engineering Entrance Exam permits aspirants to pursue bachelors program of their choice. The university gives admission for the following courses. The aspirants of the exam will have to be very precise to the dates for which the processing would go on. Here we are listing down complete Galgotia Entrance Exam events that should not be missed by willing aspirants and we will be providing you updates regarding it. The candidate should have passed in class 12th with a minimum aggregate of 50% marks with the subject combination of Physics, Chemistry, and Mathematics. The application form for the exam will be provided by the university online only. Here we are detailing you the complete process through which GEEE Online Form can be processed well. Here is the information through which one can take out information on how to apply. The application form will appear, fill it using correct information as asked in each box. Upload the documents and enter the captcha. Proceed to the payment of fee and submit it through online mode. Once done, your application will have been submitted successfully. Note: Once submitted application fee will not be refunded in any case. The GEEE Application Form Fee is INR 500/- for each applying candidate. The examination will be taken online only. Here we are listing down complete information about the exam to help you implement planning sessions similar to the Galgotias Exam Pattern. Marking: There will be no negative marking for wrong answered questions. As informed the by the university, questions will be referred from State Board of Higher Secondary Education and the CBSE syllabus only. Through the syllabus pattern discusses here, it will be easy for each of the candidates to learn the important topics of Galgotia Entrance Exam Syllabus. The subjects to be asked in the exam will be Physics, Chemistry, and Mathematics. The questions from all topics being asked in the exam paper will be in the ratio of 30:30:40 for the difficulty level of each. The detailed syllabus can be checked out from the detailed syllabus, where GEEE Exam Syllabus in detail is available. For the exam, it is crucial for all to prepare themselves enough well as the competition is tough. Here for all contenders can find some of the key tips on how to prepare for the exam. Make a schedule and follow it daily. Remember don’t invest too much time for one subject only. Solve GEEE Previous Year Question Paper regularly to keep a check on your progress. Don’t skip the NCERT or your regional board books for high-end refreshers. Take the mock tests regularly as provided by us, to test your level of preparation and scope for improvement. The admit card is the most crucial document for all to have. It is released for each participating candidate so that they can appear in the examination hall. The GEEE Admit Card will be provided to students a few days before the exam. Each one who is preparing to give the exam can download it a few days before the exam through the university website. From here, the participants can check out dates and direct links to GEEE Hall Ticket Download, making the complete process easier. The examination cell of the university releases results of entrance exam on the official website after 15-20 days of the exam. As soon as GEEE Result Date will be announced a direct link will be facilitated by us. All participants of the exam will be able to check their performance result by using direct links such as registration/roll number. Selected students will be called for counselling session organized by the university. For the counselling session, one will have to carry all original documents of qualification and other certificates with their 2 photocopies.